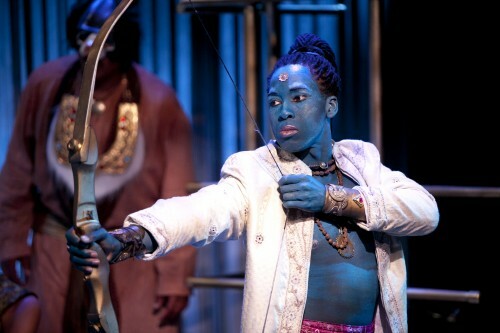 Andreu Honeycutt as Lord Rama in Constellation Theatre Company's 2011 remount of The Ramayana. Photo credit: Scott Suchman. If you were one of the many potential audience members turned away at the doors of Source last summer for The Ramayana‘s sold-out run, you’re in luck. Constellation Theatre Company has remounted its production for a limited three week engagement now through August 21, and in many ways it’s a superior show than before. Subtle changes have tightened the pacing and streamlined the focus, certainly due to director Allison Arkell Stockman, and the cast’s confidence in embodying a multiverse of the sacred and profane is noticeably stronger, with several new faces to rediscover roles. As with last year, three elements provide the visual, aural and emotional backbone of this production – the gorgeous pageantry of Kendra Rai’s costume design, the expressive sound design of percussionist Tom Teasley, and the journey of Hanuman the monkey god. Returning with the live music performance that won him the 2011 Helen Hayes Award for Outstanding Sound Design, Teasley’s magical beats propel the audience into another world. His continued collaborations with Constellation really help define their particular epic theater style. Rai’s costumes also help dissolve the modern world for the audience – still simply sumptuous (and I want to steal all the accessories). But you don’t have to be familiar with the first run to enjoy the second. Playwright Peter Oswald’s take on one of India’s most beloved and scared texts weaves essential questions of philosophy and religion through the love story of Rama and Sita as they battle the demon Ravana. Though there’s plenty of humor to be had as they enlist the help of forest creatures like the monkeys and the bears, it’s essentially a serious quest, the interplay between divinity and humanity. 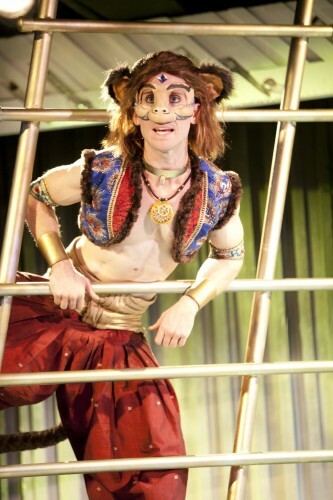 Matthew McGloin as Hanuman in Constellation Theatre Company's 2011 remount of The Ramayana. Photo credit: Scott Suchman. That relationship between gods and mortals has its fullest expression in the play with the journey of Hanuman, the monkey who discovers his true nature is divine through his devotion to Rama and Sita. Last year I loved Joe Brack’s performance in this role; this year I’m equally enthusiastic about Matthew McGloin’s interpretation. Perhaps it’s Hanuman himself who comes through so beautifully in Oswald’s writing, or that part of our humanity is being naturally sympathetic to stories of the underdog becoming a superhero. Both McGloin’s gymnastic physicality and playful primate vocality are delightful, the emotional backbone keeping the tale of gods and demons battling it out from becoming too remote. Also notably new to the cast is Jon Odom, playing the monkey king Sugriva with a mix of snappy comic timing and woeful pathos (in fact, all the monkeys have really found their rhythm this run, more endearingly hilarious than chaotic). Stepping into the ensemble as well are Maboud Ebrahimzadeh as the demon king’s brother and Keith Irby as bear king Jambavan, both with ease and gravitas. Constellation’s complete and fearless dedication to their epic theater style continues to evolve, and it’s that risk-taking which is such a pleasure to watch. A remount of a popular production might be considered a safe bet in the summer, but this isn’t a company resting on laurels – it’s obvious that thoughtful changes were made where they could be, and for the most part the ensemble is pushing themselves to new discoveries. That The Ramayana was so popular last year suggests that DC audiences are willing to sit through a long performance that mixes spectacle, dense philosophy, humor and reverence in a style that dances beyond naturalism. Next summer they’ll tackle Timberlake Wertenbaker’s haunting The Love of the Nightingale, with Teasley returning to perform live. I have a feeling it will prove to be as popular and interesting a production as this one. Constellation Theatre Company’s production of The Ramayana plays now through August 21 at the Source Theatre, located at 1835 14th Street NW, Washington, DC 20001. Closest Metro: U Street (Green/Yellow lines). For more information call 202.204.7741.